It is with deep sorrow that we announce the passing of Sebastiano (Sam) Dottor on Saturday, September 30th, 2017. Papà, nonno and bisnonno, his presence will be deeply missed by his daughters: Paola (Stan), Alida (Scott); his grandchildren: Justin (Andrea), Chad (Sarah), Julia and Siena;his great granddaughter, Amelia, as well as numerous other relatives and friends, both in Edmonton, Italy and France. Dad was predeceased by his beautiful wife of 45 years, Vittorina Dottor. Dad was a proud and dedicated member and supporter of the Associazione Nazionale Alpini (ANA),of the Associazione Trevisani Nel Mondo and of the Italian Culture Center (ICC). He was an avid fisherman, an excellent winemaker, and enjoyed a good tango, good food, good friends and good wine… traditions his family carries on with great pride. He loved his 4 grandchildren with all his heart and was thrilled to meet his first great-grandchild born earlier this year. A viewing will be held on Thursday, October 5th from 3:00 PM – 5:00 PM at Connelly-McKinley Funeral Home, 9 Muir Drive, St. Albert, T8N 1G1. 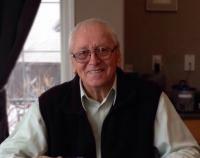 Funeral Liturgy will be held on Friday, October 6th at 2:00 PM at Connelly-McKinley Funeral Home, St. Albert. Reverend Joby Augustin, CFIC officiating. Cremation to follow at a later date. We encourage you to join us after the service for refreshments and reminiscing at The Italian Culture Center, 14230-133 Avenue NW, T5L 4W4. The family wishes to extend a heartfelt thank you to the staff at the Royal Alexandra Hospital for the care and compassion shown to dad and to the entire family. Your dedication and professionalism were appreciated more than words can say. In lieu of flowers, the family requests that donations be made to The Lung Association, Alberta and NWT, 17420 Stony Plain Rd #208, Edmonton, Alberta, T5S 1K6.